잠자는 사이 수분과 미용성분을 집중적으로 공급해주는 수면팩입니다. 가벼운 젤타입 크림팩으로 따로 씻어내거나 떼어낼 필요없이 바르고 자는 편리한 수면팩으로서 수분을 빠르게 공급하고 순환을 도와 피부를 깨끗하고 촉촉하게 해주며 거칠고 건조한 피부를 밝고 매끄럽게 가꿔 줍니다. 수면하는 동안 피부 속으로 차분히 흡수된 미용성분으로 다음날 아침, 더욱 촉촉해진 피부를 느낄 수 있습니다. 잠자기전 기초케어 마지막 단계에서 슬리핑팩을 발라주세요. 끈적임 없이 부드럽게 흡수됩니다. 아침에 미온수로 가볍게 세안해주세요. 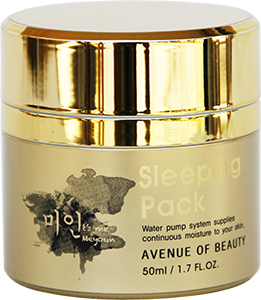 This pack supplies the water and the concentrated beauty ingredients while you are asleep. Its a light gel-type cream pack that does not require you to wash out or remove. This pack help speed up the skin to circulate and allow rough and dry skin to feel smooth and moisturized. During sleep cosmetic ingredients will slowly absorb into the skin and the next morning, you will feel and see that the skin became moist. Arbutin, hyaluronic acid, aloe vera leaf juice , Collagen, Beta-glucan, Ginseng extract, angelica extract, ginkgo biloba extract, licorice extract, green tea extract, Mulberry root extract. In the last step of base care, before sleep, apply on a sleeping pack. It will be absorbed smoothly without stickiness. Gently wash in the morning with warm water.